Using our unique search and exit data set, we have analysed the behaviour of our users in the Asia Pacific region to deliver a set of insights into their destinations of choice, interest in travelling to global annual events, and travel planning behaviour. Using the relationship between the search and exit data, we have also distinguished interest from action. Based on the first analysis, we have identified the top 10 most popular destinations by searches and exits. These rankings reveal two important insights. Firstly, 90% of the top 10 destinations are within the Asia Pacific region – the only exception being the United States. This highlights the tendency for users within this region to travel to destinations that are closer to home. Secondly, there is a misalignment between where most countries rank on searches and exits – the three exceptions being Japan, India and Vietnam. In some cases, such as Thailand, the country’s search rank is higher than their exit rank. This gap between interest and action is likely down to deterrents such as cost, and the travel options available (e.g. incompatible flight times, few direct routes). In other cases, such as the United States, the country’s exit rank is higher than their search rank. This could imply that individuals seeking to travel to this destination have high intent – resulting in a high search to exit ratio. Equally, it could also suggest that users are more familiar with their options. Through the analysis looking at the year-on-year growth of destinations by searches and exits, we can start to predict how overall travel rankings might change in the future. Whilst there are three destinations experiencing strong growth, only one is benefiting from a growth in both searches and exits: Japan. This signals that its first-place position in the search and exit rankings is unlikely to be contended. 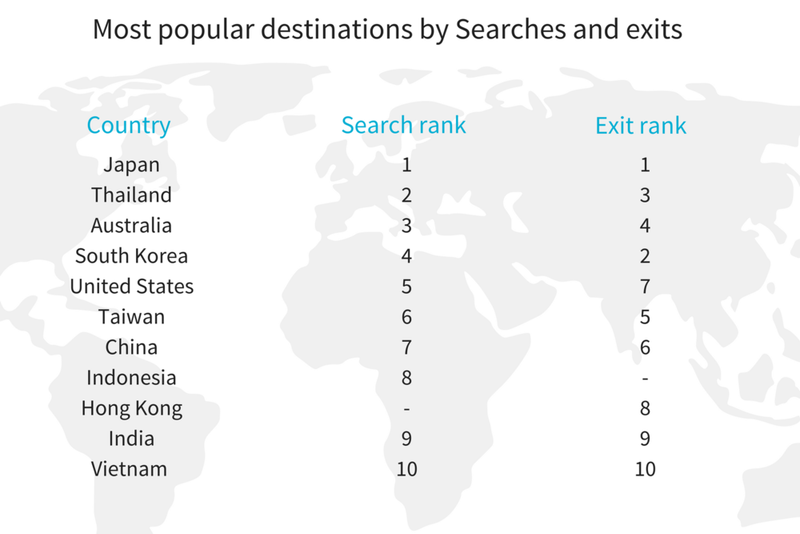 Hong Kong on the other hand could continue to grow its exit rank from 8, but it looks unlikely that it will reach the top 10 destinations by searches anytime soon. France on the other hand has seen a high growth in search volumes – meaning it could become the first European destination to enter the top 10 most popular destinations by searches. Using our third analysis, it is possible to see how destination popularity shifts when considering long-stay holidays. Interestingly, the most popular destinations are still predominantly within the Asia Pacific region. The only exceptions being the United States, which was already ranked as a popular destination, and the United Kingdom. Having said this, the ranking of the United States by exits does increase from 7 to 3 when considering long-stay holidays. Similarly, when looking at the long-stay destinations that are experiencing the most growth, it is interesting to note that all of them are in the Asia Pacific region – suggesting that the United States and the United Kingdom might struggle to keep their high-ranking positions. Particularly as South Korea and the Philippines continue to see experience high growth rates. 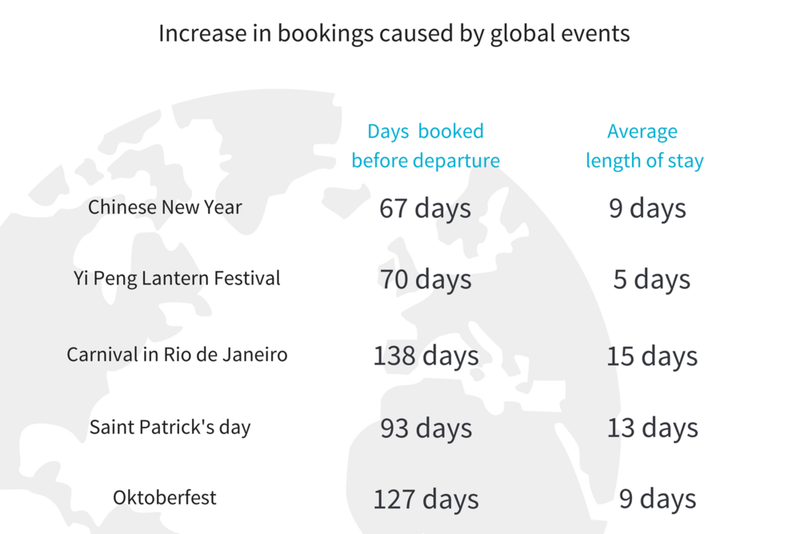 To identify which global events drive Skyscanner users in the Asia Pacific region to travel, we looked at which popular events drove a growth in exits – along with the travel behaviour of individuals travelling to the event. As is evident from the chart below, the event that drove the highest growth in exits* in 2017 was Chinese New Year, which resulted in 95%+ growth in exits. With Skyscanner users in the Asia Pacific region planning their travel an average of 67 days before their flight and staying an average of 9 days at their destination. Oktoberfest, on the other hand, drove just over 28% growth for the festival period*. By analysing the data of Skyscanner users in the Asia Pacific region, we have also identified trends in their search and exit behaviour. For searches, July is the month with the highest volume; and Tuesday is shown as the most popular day of the week to search. This is reflected in the trend for exits, which shows that July is also the month the highest exit volume and Tuesday is the most popular day of the week to exit on. This demonstrates a clear preference for arranging travel during July, and signals that there is no gap between the day that users show the travel intent and go on to book. 90% of the top 10 destinations are within the Asia Pacific region. Similarly, 80% of the top 10 long-stay destinations are within the region. And this does not look set to change, as all but one growth destination (overall and long-stay) are within the region as well. Not only does Japan currently rank first by searches and exits for travel within the region, but it is also the only destination to experience growth in both searches and exits. This suggests that it will take a lot to contend with this top travel destination. Although we often associate long-stay holidays with more distant getaways, our data from users in the Asia Pacific region has revealed that even during these breaks they are inclined to keep their travel close to home. This preference is not showing any sign of shifting either, as the high growth long stay destinations are all within the Asia Pacific region. The data on our users in the Asia Pacific region has demonstrated the most popular month for searches and exits are aligned; as is the most popular day. July has shown the highest search and exit volume for the months of 2017, and Tuesday surfaced as the day of the week that has the highest search and exit volumes. Interested in exploring the travel behaviours of other regions? Searches: On Skyscanner a 'search' is counted when a user performs a 'Return', 'One way' or 'Multi-city' search from our home page. Exits: On Skyscanner, an 'exit' is counted at the moment when a user redirects to a partner's website by selecting a travel option from our search results. Top growth destinations: Top growth destinations are the destinations within the top 20 most popular with the highest percentage growth year-on-year. Long-stay holidays: A holiday is classed as long-stay when the outbound and return date are 10+ days apart.